This article was originally published in the North Island Gazette on March 27, 2014. Port Alice sits on the banks of Neroutsos Inlet in Quatsino Sound. The Inlet was officially named by the Government of BC in 1927 after the Captain of the Canadian Pacific Railway Coastal Service, Cyril Demetrious Neroutsos. Much earlier than that, pre-1750, the Hoyalas called the area home, and in the late 1800s the Koskimo also lived in this area. It falls within the claimed traditional territory of the Quatsino First Nation. Due to its steep slopes and heavy rainfall, the area around Port Alice has been subjected to a number of mud and rock slides. In 1927 the original Port Alice townsite was struck by a slide that resulted in one fatality. A man with the last name Clark, was killed when his bachelor shack was swept away in a slide. Muddy debris tore down the hill, narrowly missing the local hospital. 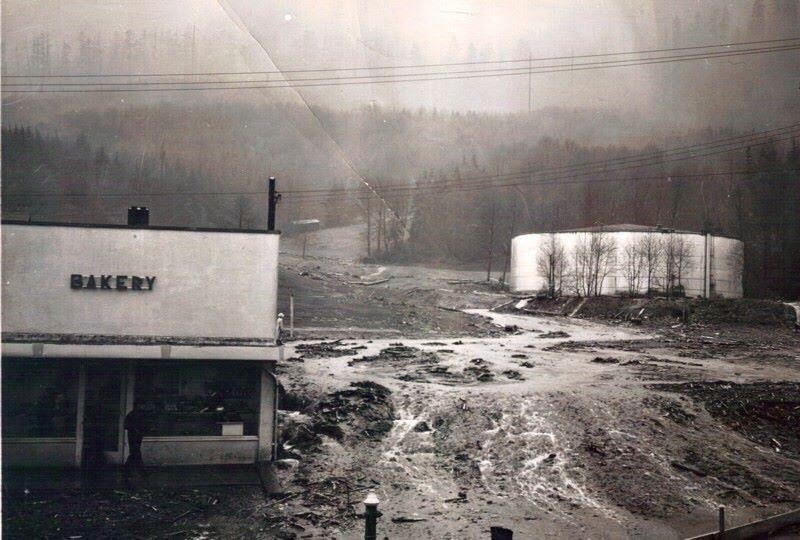 The town had experienced several days of heavy rainfall prior to the slide, and it was suspected that a dam in a creek upstream of the town had burst. In 1935 two additional slides careened down the hill, one ripping through the golf course, another coming dangerously close to the community store. Local residents pitched in to help sandbag and create berms to divert the flow of water and mud. The town was relocated in 1965, further away from the mill, in part due to the risk of slides near the mill site. Two devestating slides, however, took place in the 1970s at the new townsite. On December 15, 1973 the community suffered from a storm that lashed the coast with high winds and heavy rains. A mudslide occurred at the new townsite, knocking out utility poles, washing away a bridge, and affecting 15 houses. Ten families were unable to return to their homes. Miraculously, no one was injured, but the community was cut off from the rest of the North Island in its moment of need. There was so much debris in the water that float planes could not land, and the Marble River bridge was washed out. Although it was dangerous for boats to travel, water taxis from Coal Harbour did manage to safely get to the community and were able to ferry out a number of families who were billeted in Port Hardy. 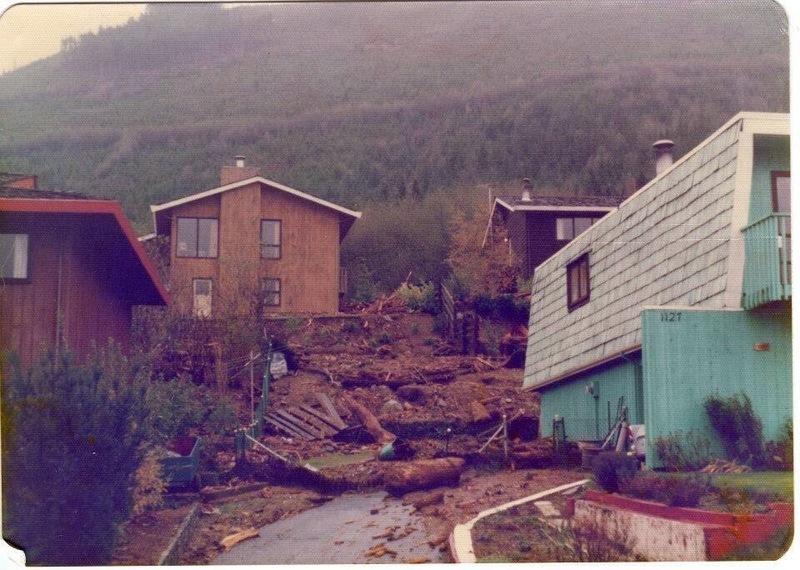 On November 12, 1975 again the town was hit with a mudslide that forced the evacuation of many residents. After these events a number of studies were undertaken to look at slope stability above the town, and a diking system was impemented to divert future slides. Tragedy struck again, however, November 10, 1987. A slide occurred on the road between the town and the mill. A number of local residents were on-site assisting with the clean-up, including Port Alice Alderman Ian Ford, when a second slide hit. Ford was standing in the path of the second slide and did not survive. September 25, 2010 the highway to Port Alice was again washed out as a part of a weather event that saw much flooding and many slides occur around the North Island.